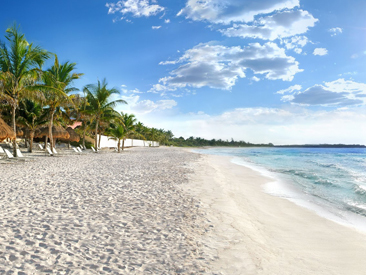 The beautifully unique Catalonia Royal Tulum is an all-inclusive adults only (18+) beachfront resort located on the spectacular Xpu-Ha beach and surrounded by lush, tropical jungle. The resort was built with an ecological concept with all rooms and public areas located among the native jungle foliage, plants, mangroves and natural water cenotes. The resort features 288 spacious guest rooms, full-service amenities and facilities and activities that cater to couples and singles alike. 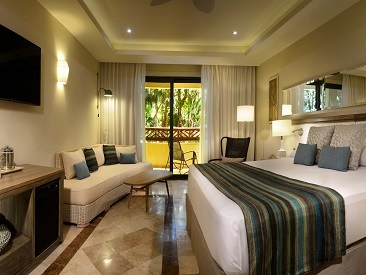 Experience the beauty of the exotic and culturally rich Mayan Rivera at the Catalonia Royal Tulum. 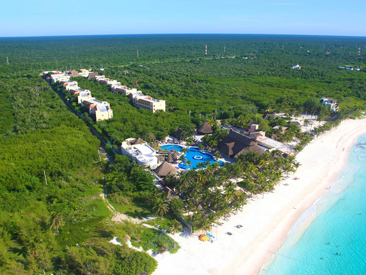 The Catalonia Royal Tulum is a perfect choice for adults looking for a unique vacation locale.The resort was developed with the protection of the environment, and all the living species that inhabit the area, in mind. Guests will discover a variety of birds and exotic animals right from the resort grounds. All of the guestrooms and public areas are strategically located among the native jungle trees, local plants, mangroves and water springs where a diverse variety of flora and fauna exist in an unspoiled habitat. There is even a traditional Yucatan cenote, a natural spring with underground rivers running through it, on site. Located just 15 minutes from lively Playa del Carmen and 22 miles from the Mayan archaeological site at Tulum, guests will find it easy to take advantage of offsite excursions. Located 19 miles from the Cancun airport. Guests enjoy FREE Wi-Fi internet connection throughout the entire hotel. Please note: Effective for stays starting October 2017, hotels in the municipality of Solidaridad will collect a new environmental sanitation tax. The tax is 20.00 pesos per room per night (approximately $1USD pending exchange rate). It will be payable directly to the hotel upon check in. Catalonia Hotels & Resorts in the Riviera Maya and Dominican Republic have been awarded once again with the prestigious Magellan Award 2018 in the hospitality, Gold and Silver category. This year the resort has been recognized by Travel Weekly with 8 of the highly anticipated Magellan Awards of 2018. Enjoy special package pricing offered from our charter gateways: Atlanta, Austin, Baltimore, Buffalo, Charlotte, Cincinnati, Cleveland, Columbus, Dallas, Detroit, Houston, Indianapolis, Kansas City, Memphis, Miami, Nashville, New Orleans, Newark, Pittsburgh and Tampa. Promotion Code: VEXPROMO- Reservations & vouchers must be identified with this code otherwise regular contracted rates will apply, SPECIAL PROMO – VACATION EXPRESS.